This post was a collaborative effort by three people with varying views on how the Ice Beam functions. 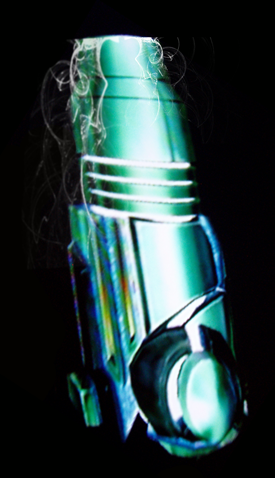 The Ice beam, one of the most iconic weapons in the Metroid series. Either it or a weapon based off of it has appeared in every game to date. But how does this weapon go about firing chunks of ice? Well, it’s actually rather simple. Most elements have a solid, liquid, and gaseous state. Using this basic knowledge of chemistry, it’s easy to come up with a simple explanation. There are two elements that are relatively common in our atmosphere: Nitrogen and Carbon Dioxide. These elements are extremely cold in their solid state. Perfect for the Ice beam. Now that the ammo system has been covered, the conversion system needs to be examined. Inside the Ice beam, there are two tubes full of solid Helium and a couple of bags of liquid Helium. These are very, very cold; so cold that they can induce a change called deposition, in which a gas changes directly to a solid. This raises questions regarding how it works in a vacuum, or on a planet with an atmosphere that doesn’t contain Nitrogen or Carbon Dioxide. This can easily be solved, however. Before the “inhaled’ air hits the Helium tubes, it passes through a storage compartment. This compartment can hold enough gas to power a couple of shots. Once that runs out, the weapon will use the liquid Helium as ammo, and finally, the two tubes of solid Helium. After that, the user’s out of luck. This is clearly a terrestrial-based weapon. The Ice beam takes in Nitrogen and/or Carbon Dioxide, freezes it, and then fires it at high speeds using compressed gases. This explains way it takes a while for the Ice beam to get off multiple shots, as it has to “inhale” before firing. It also explains why the vents on the arm cannon open when the beam is charged, as more gas is needed to fuel the greater blast. The Ice Beam is an energy weapon, like every other beam weapon. If the Ice Beam was solid, it wouldn’t be (usually) the weakest beam weapon (aside from the Power Beam of course, the only exception to this rule is in Metroid Prime, where the Ice Beam is ridiculously overpowered. It’s most likely the only game where the Ice Beam is better than missiles). It’d hit like a brick to the head, only fired at high speeds, and…that’s about all it would do, really. It’d just be a missile that doesn’t explode. Most likely, the Ice Beam is a form of thermal energy, or the lack thereof. However, the Ice Missiles, the only alternative to the Ice Beam, are inferior in freezing strength. While in the 2d games, they are definitely more powerful with damage, their freezing ability, though, is not. 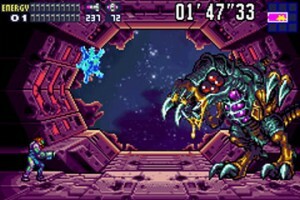 Which is, obviously, most easily shown in Metroid Fusion, where, even when you remove your weakness to freezing with the Varia Suit, SA-X’s Ice Beam is still highly effective (and of course, more damaging simply due to the addition of the Wave and Plasma Beams) while your Ice Missiles freeze SA-X for…about 1-2 seconds. The Ice Beam’s freeze, however, lasts longer, impossible unless it’s energy, as otherwise it wouldn’t completely freeze the enemy. Also, as proven by the Varialess Magmoor Run in Metroid Prime, in which the sub-zero temperatures of Phedrana Drifts do nothing to Samus with the regular Power Suit, the regular non-Fusion Varia Suit doesn’t protect from extreme cold, only extreme heat, simply because it doesn’t need to. Meaning SA-X’s Varia Suit isn’t doing very much for it against Ice Missiles, suggesting that the freezing ability of the Ice Missiles just pales in comparison to the Ice Beam, as they just coat the victim with ice. As I said, the Ice Beam is most likely weakened thermal energy, meaning it completely slows down the atomic movement around it to a very low amount, creating extreme cold. In Metroid Prime, it leaves a white trail behind the shot, which is more than likely not matter falling off of it, but the air around it freezing, then falling. When you charge it, it appears to be a solid ball of ice, though, right? WRONG. Look more closely at the charge, the “ice” is continually moving around, somewhat randomly (A possibility is that it’s spinning, though), which, if it were solid, would not happen. What you’re seeing is most likely the weakened thermal energy being concentrated, “cold” energy, if you will, like all other charges. The weakened thermal energy is most likely why the Ice Beam is so weak, the energy that composes it has been reduced severely to allow freezing (the only reason it’s so powerful in Metroid Prime is because it can be used with missiles to kill basically anything in two hits. Though it’s still powerful alone, for some reason). In Metroid Prime, enemies are frozen with the Ice Beam, then shattered with Missiles, something impossible unless the enemy is COMPLETELY frozen (in MP3, while the enemy shatters, it takes several more hits to do so, implying that they are not completely frozen, only their outsides). Liquid Helium or Liquid Nitrogen would freeze in midair if fired. Or, if the tank holding the helium was ruptured, it would vaporize and explode, likely killing Samus, not to mention the total lack of room for said tank anyway. The beams being energy weapons makes more sense. The Ice Beam could possibly pull some of the liquids inside of a creature to the outside of it’s skin which would explain why the enemies get covered in bluish clear frozen state when the beam contacts them. It damages them at the same time because of the severe dehydration. Enemies that do not freeze from contact or take multiple hits may either have a high resistance to the beam or replace the fluids quickly and require multiple hits to further dehydrate them. It is possible that those who do not freeze but die to the beam have the water evaporating on themselves, this idea is far fetched but could work if it is explained it correctly. Smaller creatures tend to die faster from the beam because they have less fluids than the larger ones. Thats very intuitve, but how does the Plasma beam Work? Hmm, might be a good idea for another article. the little mechs inside the arm cannon is true because its usually featuerd in some commercials,err,in a particular commercial on an upcoming metroid game,it is shown,and in that slow matrix shot,i was able to understand it all,the particular game is called “metroid:other m”,nintendo and team ninja combine to make a somewhat different metroid game back when she was in the military,those metroid mangas would come in handy as it is very connected in detail to the story line,it also is kinda like those halo games(which are not so bad),as a squad will accompany you OCCASIONALLY,i wish i could share more,but i feel not much of interest,and usually change subject,deeply sorry.